Barça Legends are already preparing for their match on 30 June at 7 pm at the Camp Nou against the Manchester United Legends side. Following the 3-2 win against Real Madrid Leyendas in Beirut (Lebanon) in which Giuly (2) and Simao Sabrosa scored from Ronaldinho assists, this match will be the first that the Barça Legends team have played at the Camp Nou. The blaugranas will travel to Manchester for the return match on 2 September at Old Trafford (3 pm, local time). Barça Legends coach, José Mari Bakero, will be able to count on the following players for the game: Angoy, Guzmán, Juan Carlos, Popescu, Nadal, Belletti, Andersson, Dehu, Edmílson, Goikoetxea, Mendieta, Giuly and Julio Salinas. Over the next few weeks, other players’ participation in the fixture will be announced. On behalf of Manchester United Legends, ex-United players such as Blomqvist, Fortune, Poborsky, Scholes, Phil Neville, Silvestre and Dwight Yorke, among others, have confirmed their presence for the game. All of the proceeds from the match between the legends of FC Barcelona and Manchester United will go to the PCCB project (Pediatric Cancer Center Barcelona) of the Sant Joan de Déu Hospital which aims to ensure cancer treatment for all children in need. The prices of tickets will range between 10 and 21 € and benefits will be entirely donated to the construction of the new centre and children’s cancer research. How to get tickets Tickets for the match are now on sale and can be obtained through the usual sales channels of the Club. 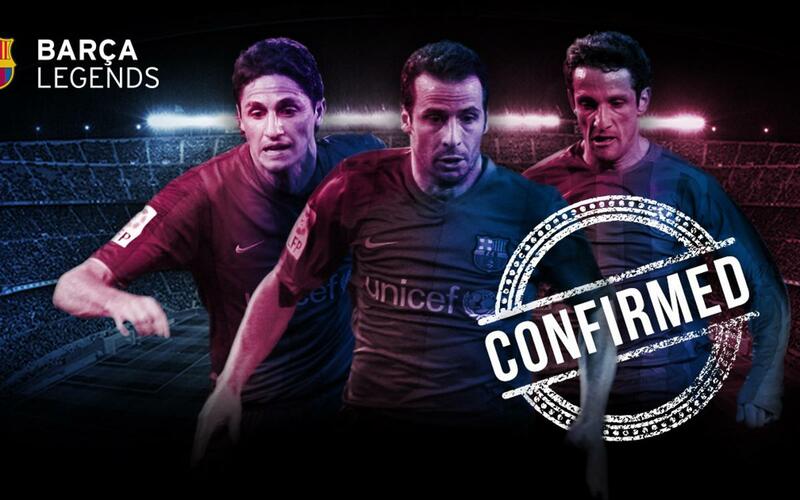 Fans can buy tickets from the official website of FC Barcelona via this link. Alternatively, tickets can be purchased at the ticket office of the Camp Nou and the Ticketmaster portal. Who are the Barça Legends The Barça Legends are the result of an FC Barcelona programme which aims to honour the legacy of the footballers who have played for the Club. The project looks to contribute to the globalisation of the Barça brand and its values through ex-players, as well as making sure these players’ careers remain profitable following their retirement from the professional game. The initiative plans to organise matches and events in a variety of different places around the world.